We offer janitorial mop kits with several color coded mop heads that can be used to clean different parts of the kitchen, and the color coded mop heads allow you to assign each area a color which prevents cross-contamination. Some of our mop kits also have a janitorial cart and mop bucket, so you can store your cleaning supplies all in one handy place. 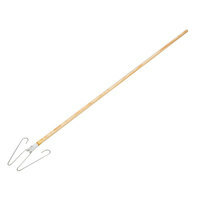 Also, our mops have long handles for those hard-to-reach places where bacteria might be hiding. Also make sure to check out other great items from Lavex Janitorial, Lavex Lodging, 3M, Continental, Rubbermaid and Unger. Cleaning is a vital task for restaurants to ensure an enjoyable and safe meal for customers. We offer mopping products with microfiber pads and color-coded mop heads that attract dirt and make cleaning quick and easy. Also, our mop kits provide all of the supplies you need to keep your facility sanitary and clean. 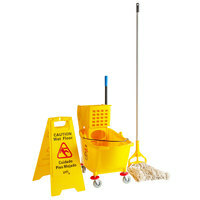 For more cleaning products, check out our wet mop buckets and wringers, floor care chemicals, and wet floor signs. If you're wondering where to buy lavex janitorial mop kits, we have a large selection of lavex janitorial mop kits for sale at the lowest prices.